It’s been HOT this summer! Did your last electric bill scare you? It scared me. I started shopping for solar energy. But I am no engineer. I don’t understand watts and gig-a-whatever and invertors- micro or otherwise. I am a patsy waiting to be taken by the first charming Charleton that comes along. 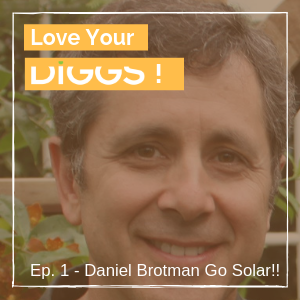 On this- our very first episode of Love Your DIGGS, we talk to Solar Energy Advocate, Daniel Brotman. Dan is an adjunct professor at Glendale Community College and runs the group Glendale Environmental Coalition. He gives some amazing tips on how to find the best solar energy company for you.